We will offer a series of informational meetings for parents interested in hearing more about American Heritage Girls. Your daughter will have a chance to participate in a regular meeting and meet other girls; you will be able to observe her activities, as well as have a time to learn about the program and ask questions. 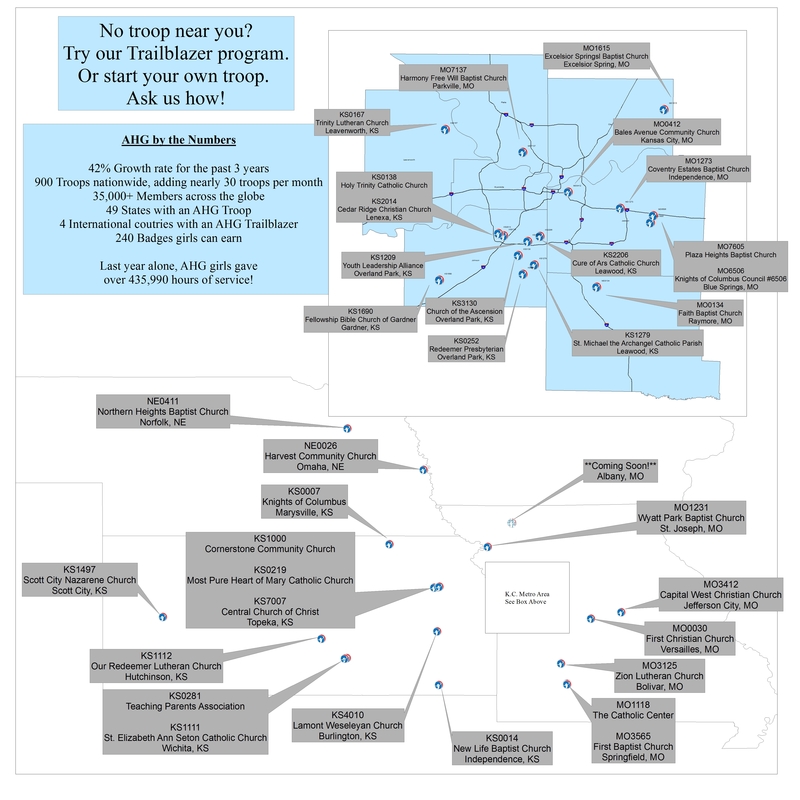 For more information, please contact our South Overland Park Troop. Stop by, say hi, and see what we have planned for the coming year, during the Ministry Fair, August 23-24, following all masses. KS1209 has moved! They will now be meeting at Emmanuel Baptist Church, 101st and Metcalf, in central Overland Park. To learn more about this Troop, plan to attend an Information Night Tuesday, August 19 at 6:30pm. There will be an informational presentation for parents, and the girls will begin working on their Joining Award, which serves as a good introduction to AHG for them as well. Join us as we celebrate summer coming to an end and a new year of AHG beginning. Bring a guest to enjoy fun games and your favorite ice cream with lots of toppings. We’ll have a time to share information about the upcoming year with parents, and also an opportunity for the girls to get acquainted with each other and their leaders. Come see what AHG is all about! We will offer a series of informational meetings for parents interested in hearing more about American Heritage Girls. Saturday, June 22, 4:30 & 6:00 p.m.
Sunday, June 23, 8:00, 9:30 & 11:00 a.m. These will be held during Grace’s regular weekend services, so there will be children’s classes available from nursery through 5th grade, for your convenience. Please allow yourself 15 minutes to get the children settled before our meeting starts. Of course, older girls are welcome to join our meeting as well, to see for themselves what AHG is all about.